Deborah Cullen, the curator of the Biennial, has selected the artists that survey extensions of traditional techniques, as well as new approaches to printmaking that respond to our 21st-century modes. Fresh applications of traditional media and innovative incorporations of new technologies attest to the lasting relevance of graphic processes. Interruption explores the graphic as both form and content, in an invigorated terrain that links the work of diverse contemporary artists from around the world. The main exhibition of the 30th Biennial of Graphic Arts: Interruption will be accompanied with many smaller, focused exhibitions. The Biennial’s origin and history will be explored in The Biennial of Graphic Arts – Serving You Since 1955 at Cankarjev dom Gallery. Regina José Galindo will be presented in The Anatomy Lesson at the Jakopič Gallery. Museum of Contemporary Art Metelkova will host the works of Miklós Erdély: The Original and the Copy + Indigo Drawings. Project Leisure, Discipline and Punishment connects The Biennial of Graphic Arts Ljubljana, The Biennial of Moving Image/Contour Mechelen, The Göteborg International Biennial for Contemporary Art and The Liverpool Biennial. 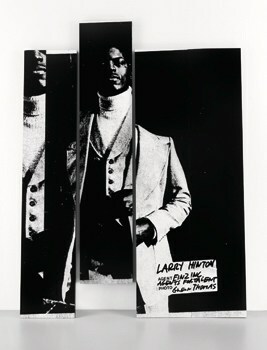 Photo: Adam Pendleton, “Larry Hinton (white),” 2012. Silkscreen ink on Formica, overall installation, variable dimensions, 304.8 cm x 61 cm, 4 panels, each unique. Courtesy the artist and Galeria Pedro Cera, Lisbon.